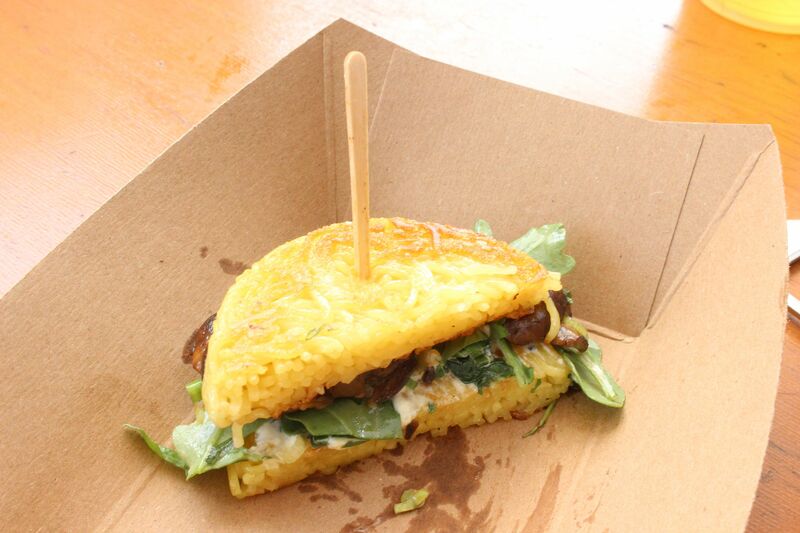 In the summer of 2013, it seemed that the highly touted and immensely popular “Ramen Burger” was set to take over the state of New York. Pictures of long lines, succulent burger sandwiches and satisfied eaters would flood social media over Smorgasburg‘s newest concoction. Fast forward two years, and while the legend of the “Ramen Burger” lives on, its availability has become more accessible. Food stalls have popped up in both Manhattan and Brooklyn, as well as in Los Angeles and Tokyo- not to mention the Financial District’s brick and mortar shop Ramen.Co, where the innovative creator of the “Original Ramen Burger” remains loosely affiliated. 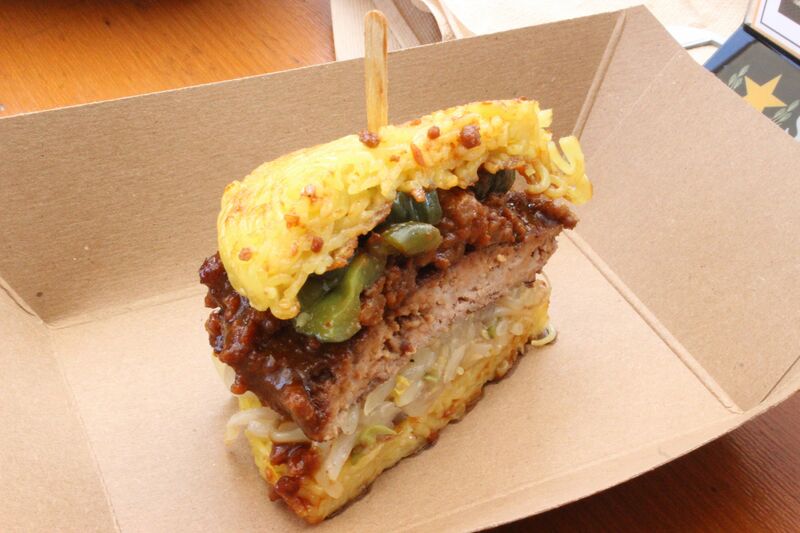 But as his empire expands, Keizo Shimamoto remains dedicated to the dish that brought him to the dance- a seasoned Schweid & Sons beef patty that sits between two ramen buns, pasted together miraculously and generously topped with scallions and some sticky sauce. Collectively, the ingredients work together fantastically as any honest critic will attest. 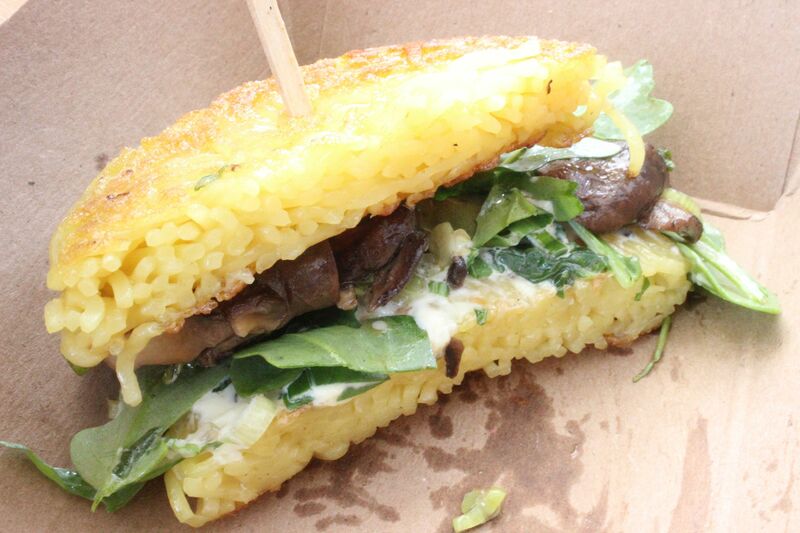 After all, there’s a reason why this sandwich literally went viral. 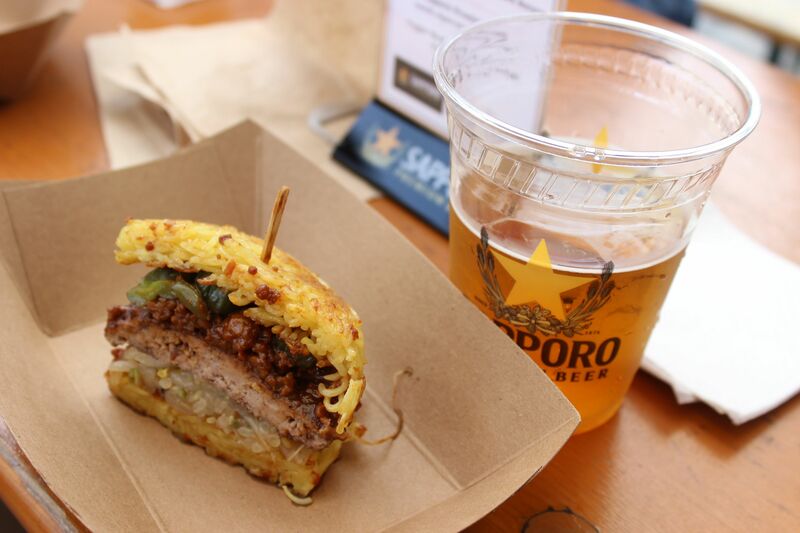 Inspired by traditional Japanese styles of ramen, Shimamoto teamed with the folks at Sapporo Premium Beer to host a special lunch pairing menu at the site of Ramen Burger’s most recent pop-up space. Seaport Smorgasburg, a burgeoning collection of mini-food stalls in downtown Manhattan houses the likes of Pizza Moto, Lumpia Shack and Red Hook Lobster Pound seven days a week. But on Tuesday afternoon, all eyes and mouths nearby would be captivated by the debut of Chef Shimamoto’s latest creation. 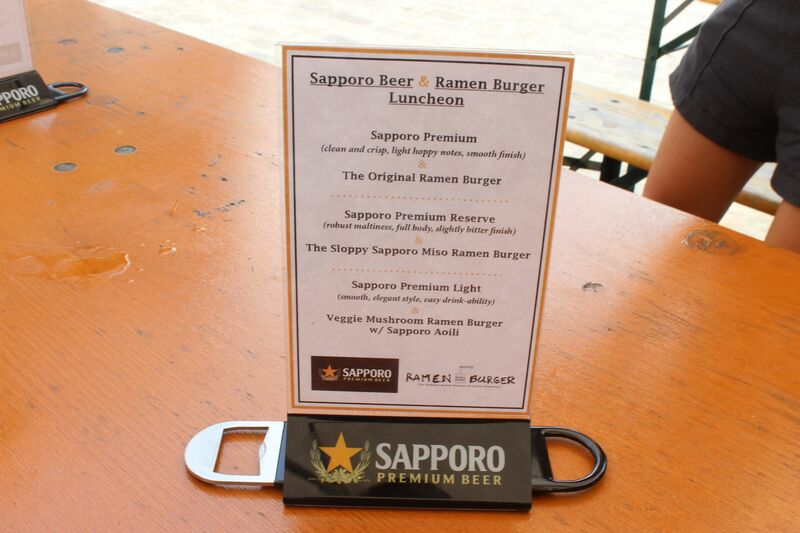 Marrying a tall, frothy cup of Sapporo Premium Reserve- a crisp and full-bodied beer- with the first ever serving of Shimamoto’s “Sloppy Sapporo Miso Ramen Burger” was a bit of pairing expertise. The ice cold beer’s subtle and bitter finish would serve to wash down the savory hunks of tender ground pork that topped the new-fangled take on the “Ramen Burger,” complemented by the likes of briny Japanese pickles and crunchy bean sprouts for balance. Sloppy is perhaps the best way to describe the handheld sandwich, where a fork will almost certainly be necessary to devour any ingredients that remain on one’s plate. 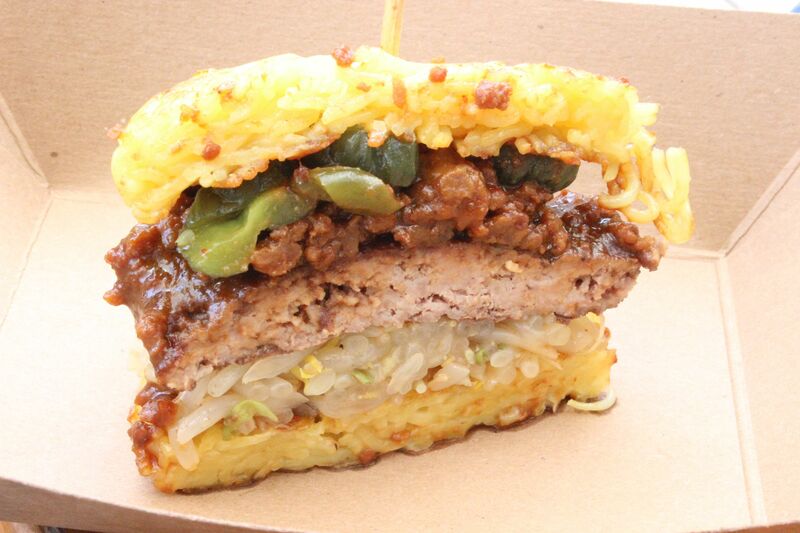 Similar in size to the original, the “Miso Ramen Burger” is decidedly- and purposefully- more Sloppy Joe than outright burger, but the added ingredients allow the overall flavors to more closely resemble Japanese fare rather than a traditional hamburger. 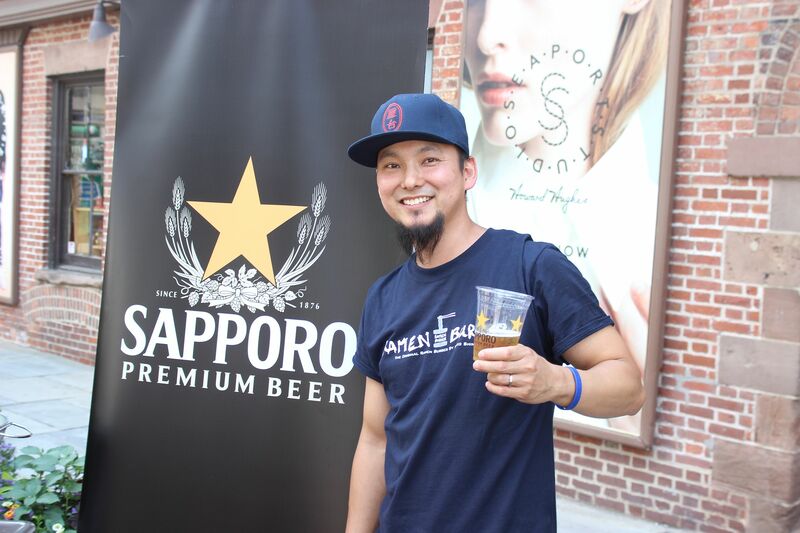 Given Shimamoto’s background, building a partnership with Sapporo was seemingly a no-brainer- and as such, he’s utilized actual pours of their beer in creating his new ‘Burger,’ rumored to be making its way onto the menu at Ramen Burger stalls. Other courses would feature the “Veggie Mushroom Ramen Burger,” decadently lacquered with a rich Sapporo Aioli and paired with an easy drinking Sapporo Premium Light Beer, as well as the traditional “Original Ramen Burger” paired with the iconic silver can of Sapporo Premium, worked equally as well- but candidly, we were pretty excited by the newly introduced dish. With temperatures approaching ninety degrees, nothing says summertime like sitting comfortably by the water, with a beer in hand and a burger in the other. And although on this day our beer is a Sapporo and our burger is enveloped in ramen noodles, it’s an unorthodox marriage upon which we’re more than proud to give our blessing. LocalBozo.com: How did the idea for ‘The Sloppy Sapporo Burger’ come to be? LocalBozo.com: How long did it take you to tinker with the recipe to get it exactly where you wanted it? KS: It was actually maybe like a month or so that we’ve been talking about this and then- really, I was so busy with all this other stuff and I took this past Sunday and devoted the whole day to finalizing the recipes here and that’s when it all came together with the bean sprouts and the pickles. LocalBozo.com: Is it still in a testing phase or do you think it’s going to make its way to the menu? KS: I don’t know you tell me. LocalBozo.com: The response at our table was nothing but positive. LocalBozo.com: Have you showed it to anybody that was less than excited about it? KS: No, everyone who’s tried it was really excited about it so I think it’s going to work its way onto the menu. LocalBozo.com: So, you just opened in LA pretty recently? KS: I have my brother taking care of west coast operations for Ramen Burger and he opened a brick and mortar in LA and we recently opened in Tokyo too. LocalBozo.com: Awesome, and how has the response been there? Pretty good? KS: It’s funny because it’s something that- I was inspired by working in Japan and I came over here and the Ramen Burger was a hit. And so, bringing it back to Japan is something interesting, you know? A Japanese-American guy studied in Japan, made something famous in America- and then took it back to Japan.